I had always hoped that cancer would be conquered within my lifetime, but I’m no longer sure that will happen. Cancer is a complex disease. In fact, it’s not just one disease; every single cancer is different on a genetic basis. Consequently, a cure for cancer remains elusive. I was pleased to hear that the new Calgary Cancer Centre will be developed as a single site at the Foothills campus. The Province of Alberta got it right – if our goal is to cure cancer, then we need a comprehensive facility that provides integrated research and patient care, along with the opportunity for physicians to work side-by-side with highly specialized scientists from a variety of disciplines. The Foothills site makes this possible. In light of this week’s announcement, I thought I’d reflect on my recent tour of the Tom Baker Cancer Centre. The Tom Baker Cancer Centre, located at the Foothills Medical Centre campus in Calgary, is winning a few of the battles in the war on cancer. Earlier detection, better screening and improved treatments are improving patient survival. My tour guide was Dr. Barry Bultz, Director of the Department of Psychosocial Oncology. As one enters the Tom Baker Cancer Centre, there is a plaque near the main door that reads “to cure sometimes, to relieve often, to comfort always.” Barry Bultz plays the “to comfort always” role. As we chatted in his office in the psychosocial oncology unit, Barry spoke ardently about the impact of cancer-related distress on the patient’s experience. Cancer is a miserable disease and is characterized by suffering, pain and death. 30-40% of cancer patients are distressed. Health care providers are trained to recognize distress in their patients and provide support. Barry then led me through several other departments including radiation oncology, medical physics, nursing and the outpatient chemotherapy unit. I was especially interested in the radiation therapy simulators. As we moved about the Cancer Centre, I chatted with several of the Tom Baker staff members – researchers, social workers, psychologists, scientists, doctors and nurses. They are all dedicated and proud that their Cancer Centre is making an impact. When describing the care that they provide to the citizens of southern Alberta, the staff repeatedly used words like ‘comprehensive’, ‘integrated’ and ‘multidisciplinary’. I was impressed. This culture of collaboration at the Tom Baker Cancer Centre reminded me of another exemplary institution – the Montreal Neurological Institute (MNI). As a former student of the McGill University medical school, I am familiar with the history of the MNI. The Institute was founded by Dr. Wilder Penfield in the 1920s on two principles. First, Dr. Penfield integrated research and patient care. He refused to continue the traditional practice of sequestering researchers at a remote location on a university campus. 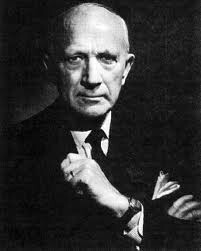 Dr. Wilder Penfield, former director of the Montreal Neurological Institute and founder of the modern research enterprise. Second, Dr. Penfield insisted that physicians work side-by-side with highly specialized scientists from a variety of disciplines. He predicted correctly that innovations would emerge as people offered each other ideas drawn from different scientific backgrounds and worked together synergistically. The Montreal Neurological Institute is a classic example of the modern research enterprise. The Tom Baker Cancer Centre is its 21st century equivalent, albeit a larger facility is needed to support Calgary’s growing population. Today, both institutions recognize interdisciplinary and translational research as pillars of innovation. Cancer is a renegade disease. Since Calgary’s population is growing and aging, the incidence of cancer cases in our city is unfortunately rising. If we are to do better than “to cure sometimes”, then the comprehensive, integrated and multidisciplinary culture at the Tom Baker Cancer Centre must flourish. Its organizational structure must continue to support collaborative innovations. I’m pleased the home of the new Calgary Cancer Centre will remain close to our researchers. Education, Healthcare Calgary, Cancer, Montreal, Penfield, research, Robert Thirsk, Tom Baker Cancer Centre. permalink.